Citrea Pizzeria opened back in March in Binghamton. Its location is both pro and con - situated with a front row view of the Susquehanna River, but also adjacent to some of the new student housing in Binghamton, which may provide dining companions not savored by all in the Southern Tier. I've eaten at Citrea twice now; the first, during its opening week, on Parade Day. We came with a large group and tried every pie featured on the limited menu at the time. My favorite was the salciccia, with pepperoni and sausage, though my affection for the salted, cured meats could have been inspired by the quantities of beer I'd so far consumed that day. Like most wood-fired, brick oven pizzerias, Citrea's crust is crunchy, with an airy, arid, chewy interior texture formed by the intense heat. It may be less moist than you're used to if your usual pie comes from a conventional oven, but the thin, toothsome base provides flavor and texture that suits Citrea's robust toppings. On that first visit, I found those toppings a bit goopy - as if the chef hadn't yet mastered the hot and cool spots in his oven. Rest assured, that minor weakness has been remedied hence. 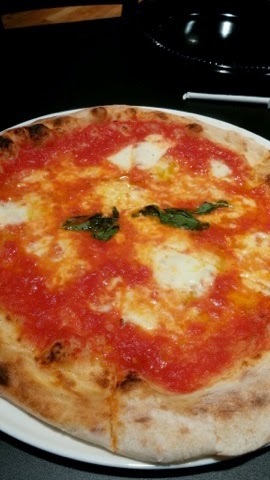 I also enjoyed the di fungi and margherita pies on that occasion. 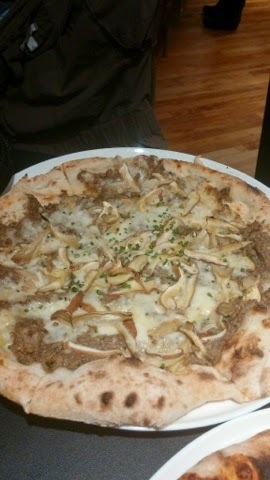 The former, mild and woodsy, with its array of wild shrooms and milky fontina cheese, the latter, bright and straightforward, but again, a tad bit goopy for my liking. 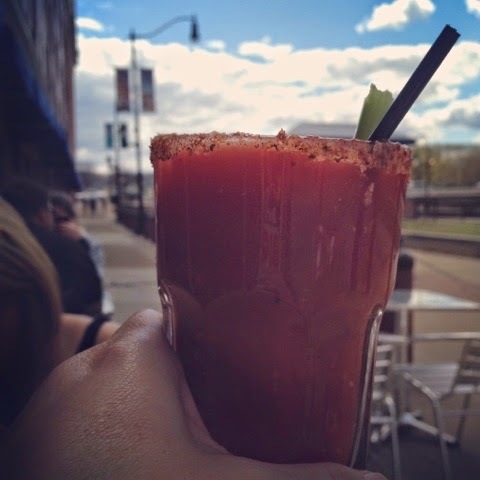 A return visit, just a couple weeks ago, took place at brunch time, and began with bloody marys, in accordance with the prophecy. These were not overly spicy, but deeply flavored with good tomato taste and spices. We started with French fries and crispy Brussels sprouts. 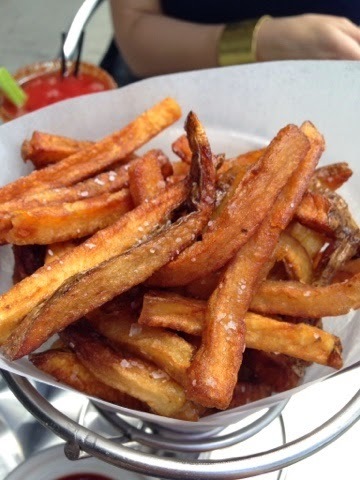 The fries were major - hand cut, skin-on, double fried, and expertly seasoned with sea salt. This place is going to give Zona's a run for their money if word gets out about these garlic oil-laced, crunchy things of beauty. We loved them. 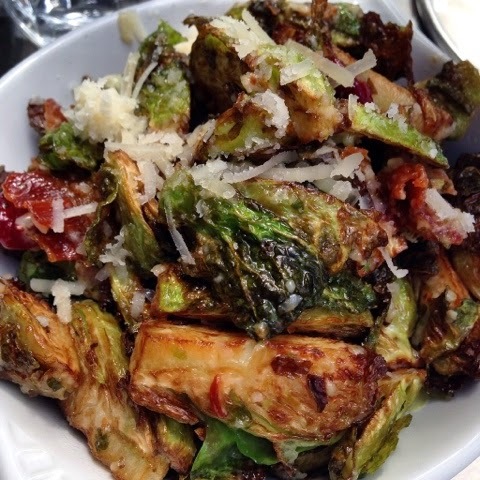 The sprouts were another item to covet - oven roasted with bacon until browned and sweet, their raw funk mellowed into submission by the wood oven. The sprinkle of nutty, salty Parmesan on top was smart - it echoed the richness of the bacon in a way that really worked. This is a terrific way to eat your vegetables! 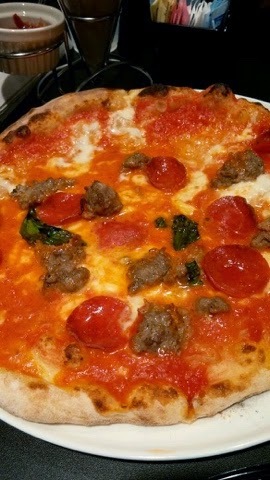 The buongiorno pie, however, is my favorite thing at Citrea now. 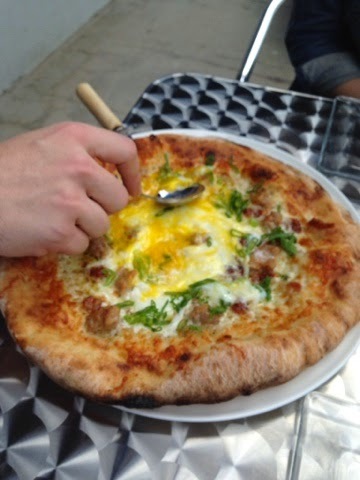 This is a brunch pizza, with sausage, green onions, provolone cheese and egg yolk smeared across the top by the server. 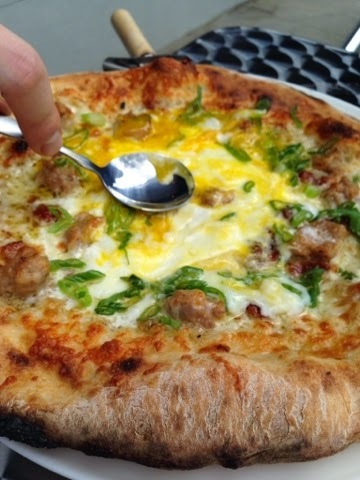 The provolone and egg yolk were groaningly good together, and just before your mouth might have gone on richness overload, the scallions leant sharpness to point each bite up in the right direction. I have to also mention the semifreddo dessert, which we liked much more than we anticipated. A frozen treat with a texture more like frozen whipped cream than custard, the addition of sweet cherries and sliced almonds gives this treat texture, variety, and complexity. I didn't get a photo, but I'll share one next time I devour this unique dish. Sitting on the patio at Citrea is a much more enjoyable experience, for me, than dining inside. The river walk is lovely on a sunny day, and this food lends itself to casual, al fresco dining. Inside, it's a bit spare, which is wise, considering students can tend towards rowdiness, and the restaurant serves just as much as their nearest pizza joint as it does a higher end eatery - the metal tables and chairs are easy to clean and difficult to destroy, I imagine. It also can be loud, due to a lack of soft surfaces. I don't mean to look down on our student population, mind you; Hell, I've been there, and I understand all too well the siren song of good pizza after a boisterous night out. We've had personable and knowledgeable service on both occasions we've dined there, though perhaps a wee bit less attentive than one would like if one is fond of several rounds of brunch cocktails. I award Citrea a seven on the BHS scale for above average food - actually, pretty great food - served in a casual, bright setting. I look forward to my next visit, and to trying the remaining menu items, like an intriguing burratta salad and short ribs made with chocolate. I feel like I'm all out of rhythm with the blog, and I apologize for that, Hungries. I endeavor to get back on track, and I'm poised to bring you reviews from a recent trip to Salem, Mass. as well as a fun brunch in Syracuse and a look at Guy Fieri's Poconos Kitchen. My personality is big; my hunger is bigger!